WarMage Battlegrounds is a free to play multiplayer online fantasy battle game. Begin by creating a WarMage and then you’re just moments away from exciting, turn-based tactical combat battles. Build and configure a mighty combat force from a huge collection of powerful spells, deadly battle units, ancient artifacts, and magical items and then attempt to vanquish your enemies in highly entertaining turn-based fantasy battles. 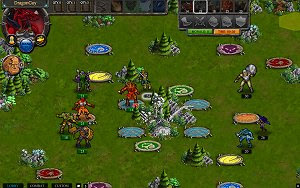 WarMage Battlegrounds is designed for up to 4 players, is free to play, and runs in any web browser without a download. WarMage Battlegrounds delivers a fast-paced and rewarding cooperative and competitive fantasy battle experience by improving upon traditional turn-based, tactical combat strategy game mechanics. Combat mechanics reward strategic thinking, knowledge-based skill, and careful battle preparation, while simplifying the decisions made during each players’ turn, to deliver loads of fun for any fan of turn-based strategy games.